Modern mining is an industry that involves the exploration for and removal of minerals from the earth, economically and with minimum damage to the environment. Mining is important because minerals are major sources of energy as well as materials such as fertilizers and steel. Mining is necessary for nations to have adequate and dependable supplies of minerals and materials to meet their economic and defense needs at acceptable environmental, energy, and economic costs. Some of the nonfuel minerals mined, such as stone, which is a nonmetallic or industrial mineral, can be used directly from the earth. Metallic minerals, which are also nonfuel minerals, conversely, are usually combined in nature with other materials as ores. These ores must be treated, generally with chemicals or heat to produce the metal of interest. Most bauxite ore, for example, is converted to aluminum oxide, which is used to make aluminum metal via heat and additives. Fuel minerals, such as coal and uranium, must also be processed using chemicals and other treatments to produce the quality of fuel desired. © Charles E. Rotkin/Corbis. Reproduced by permission. raw materials to obtain the target mineral, technology, the length of time to obtain a permit to mine, and proximity to markets, among others. The U.S. mining industry is facing increasing challenges to compete with nations that have lower labor costs—for example, less stringent environmental regulations and lower fuel costs. Minerals are a nonrenewable resource, and because of this, the life of mines is finite, and mining represents a temporary use of the land. The mining life cycle during this temporary use of the land can be divided into the following stages: exploration, development, extraction and processing, and mine closure. Exploration is the work involved in determining the location, size, shape, position, and value of an ore body using prospecting methods, geologic mapping and field investigations, remote sensing (aerial and satellite-borne sensor systems that detect ore-bearing rocks), drilling, and other methods. Building access roads to a drilling site is one example of an exploration activity that can cause environmental damage. The development of a mine consists of several principal activities: conducting a feasibility study, including a financial analysis to decide whether to abandon or develop the property; designing the mine; acquiring mining rights; filing an Environmental Impact Statement (EIS); and preparing the site for production. Preparation could cause environmental damage by excavation of the deposit to remove overburden (surface material above the ore deposit that is devoid of ore minerals) prior to mining. Extraction is the removal of ore from the ground on a large scale by one or more of three principal methods: surface mining, underground mining, and in situ mining (extraction of ore from a deposit using chemical solutions). After the ore is removed from the ground, it is crushed so that the valuable mineral in the ore can be separated from the waste material and concentrated by flotation (a process that separates finely ground minerals from one another by causing some to float in a froth and others to sink), gravity, magnetism, or other methods, usually at the mine site, to prepare it for further stages of processing. The production of large amounts of waste material (often very acidic) and particulate emission have led to major environmental and health concerns with ore extraction and concentration. Additional processing separates the desired metal from the mineral concentrate. The closure of a mine refers to cessation of mining at that site. It involves completing a reclamation plan and ensures the safety of areas affected by the operation, for instance, by sealing the entrance to an abandoned mine. Planning for closure is often required to be ongoing throughout the life cycle of the mine and not left to be addressed at the end of operations. The Surface Mining and Control Act of 1977 states that reclamation must "restore the land affected to a condition capable of supporting the uses which it was capable of supporting prior to any mining, or higher or better uses." Abandoned mines can cause a variety of health-related hazards and threats to the environment, such as the accumulation of hazardous and explosive gases when air no longer circulates in deserted mines and the use of these mines for residential or industrial dumping, posing a danger from unsanitary conditions. Many closed or abandoned mines have been identified by federal and state governments and are being reclaimed by both industry and government. The environmental responsibility of mining operations is protection of the air, land, and water. Mineral resources were developed in the United States for nearly two centuries with few environmental controls. This is largely attributed to the fact that environmental impact was not understood or appreciated as it is today. In addition, the technology available during this period was not always able to prevent or control environmental damage. Air. All methods of mining affect air quality. Particulate matter is released in surface mining when overburden is stripped from the site and stored or returned to the pit. When the soil is removed, vegetation is also removed, exposing the soil to the weather, causing particulates to become airborne through wind erosion and road traffic. Particulate matter can be composed of such noxious materials as arsenic, cadmium, and lead. In general, particulates affect human health adversely by contributing to illnesses relating to the respiratory tract, such as emphysema, but they also can be ingested or absorbed into the skin. Land. Mining can cause physical disturbances to the landscape, creating eyesores such as waste-rock piles and open pits. Such disturbances may contribute to the decline of wildlife and plant species in an area. In addition, it is possible that many of the premining surface features cannot be replaced after mining ceases. Mine subsidence (ground movements of the earth's surface due to the collapse of overlying strata into voids created by underground mining) can cause damage to buildings and roads. Between 1980 and 1985, nearly five hundred subsidence collapse features attributed to abandoned underground metal mines were identified in the vicinity of Galena, Kansas, where the mining of lead ores took place from 1850 to 1970. The entire area was reclaimed in 1994 and 1995. Water. Water-pollution problems caused by mining include acid mine drainage, metal contamination, and increased sediment levels in streams. Sources can include active or abandoned surface and underground mines, processing plants, waste-disposal areas, haulage roads, or tailings ponds. Sediments, typically from increased soil erosion, cause siltation or the smothering of streambeds. This siltation affects fisheries, swimming, domestic water supply, irrigation, and other uses of streams. "Yellowboy" is the name for iron and aluminum compounds that stain streambeds. AMD can enter the environment in a number of ways, such as free-draining piles of waste rock that are exposed to intense rainstorms, transporting large amounts of acid into nearby rivers; groundwaters that enter underground workings which become acidic and exit via surface openings or are pumped to the surface; and acidic tailings containment ponds that may leach into surrounding land. Some major federal laws and regulations affecting the mineral industry include the Comprehensive Environmental Response, Compensation and Liability Act (CERCLA), commonly known as Superfund, enacted in 1980. This law requires operations to report releases of hazardous substances to the environment and requires cleanup of sites where hazardous substances are found. The Superfund program was established to locate, investigate, and clean up the worst abandoned hazardous waste sites nationwide and is currently being used by the U.S. Environmental Protection Agency (EPA) to clean up mineral-related contamination at numerous locations. The Federal Water Pollution Control Act, commonly referred to as the Clean Water Act, came into effect in 1977. The act requires mining operations to meet standards for surface water quality and for controlling discharges to surface water. The Resource Conservation and Recovery Act (RCRA), enacted in 1976, regulates the generation, storage, and disposal of solid waste and hazardous waste, using a "cradle-to-grave" system, meaning that these wastes are governed from the point of generation to disposal. The National Environmental Policy Act (NEPA), enacted in 1970, requires federal agencies to prepare EIS for major federal actions that may significantly affect the environment. These procedures exist to ensure that environmental information is available to public officials and citizens before actions are taken. NEPA applies to mining operations requiring federal approval. The European Union (EU) has developed a set of environmental directives that have had a significant effect on the mining industries of member nations. Each country's environmental laws derive from these directives. Among the key directives are the Environmental Impact Assessment Directive (similar to the EIS requirements of the United States), the Water Framework Directive (addresses concerns similar to those of the U.S. Clean Water Act), and the Waste Framework, Hazardous Waste, and Landfill Directives (all address concerns similar to those of the U.S. RCRA). The Bunker Hill Mine complex is located in northwest Idaho in the Coeur d'Alene River Valley, and has a legacy of nearly a hundred years of miningrelated contamination since 1889. 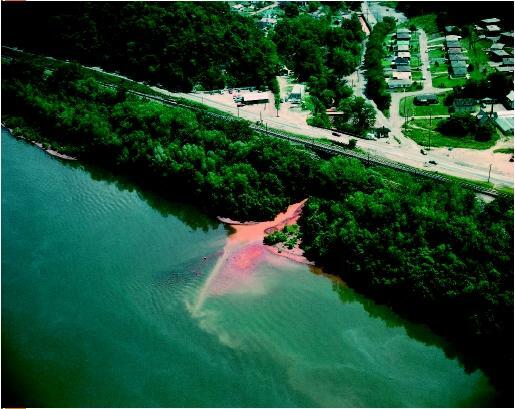 Operations ceased in 1982, and the EPA declared much of the area a Superfund site in 1983. The complex produced lead, zinc, cadmium, silver, and gold, as well as arsenic and other minerals and materials. Much of the mining pollution was caused by the dispersal of mining wastes containing such contaminants as arsenic, cadmium, and lead into the floodplain of the Coeur d'Alene River, acid mine drainage, and a leaking tailings pond. The metals contaminated soils, surface water, groundwater, and air, leading to health and environmental effects. Lead, in particular, was noted for its health effects on children in the area. EPA reports concerning lead poisoning state that experts believe blood levels as low as 10 micrograms per deciliter (μg/dl) are associated with children's learning and behavioral problems. High blood lead levels cause devastating health effects, such as seizures, coma, and death. Blood levels of children in areas near the complex ranged from about 35 to 65 μg/dl in the early 1970s to less than 5 percent in 1999, as remediation efforts progressed. EPA reports also state that children are at a greater risk from exposure to lead than adults because, among other reasons, children absorb and retain a larger percentage of ingested lead per unit of body weight than adults, which increases the toxic effects of the lead. Efforts by the federal government, the state of Idaho, and industry to remediate contaminated areas associated with the site are ongoing. There are also many mines with successful reclamation plans. For example, the Ruby Hill Mine, which is an open pit gold mine in Eureka, Nevada, won a state award in 1999 for concurrent reclamation practices, such as using revegetation and employing mitigation measures to offset potential impacts to local wildlife. The mining of asbestos, either as the primary mineral or included as an unwanted material while mining for the "target" mineral, is one of the more controversial issues facing the mining industry in the United States. Asbestos is the name given to a group of six naturally occurring fibrous minerals. Asbestos minerals have long, strong, flexible fibers that can be spun and woven and are heat-resistant. Because of these characteristics, asbestos materials became the most cost effective ones for use in such items as building materials (roof coatings and shingles, ceiling and floor tiles, paper products, and asbestos cement products) and friction products (automobile clutch, brake, and transmission parts). Unfortunately, it has been found that long-term, high-level exposure to asbestos can cause asbestosis and lung cancer. It was also determined that exposure to asbestos may cause mesothelioma, a rare form of cancer. Workers can be exposed to asbestos during mining, milling, and handling of ores containing asbestos or during the manufacture, installation, repair, and removal of commercial products that contain asbestos. One of the more recent controversies involving asbestos is the exposure of workers and the local residents to asbestos found in vermiculite ore mined in Libby, Montana. The vermiculite ore was shipped nationwide for processing and was used for insulation, as a lightweight aggregate, in potting soils, and for agricultural applications. Mining of the Libby deposit ended around 1991 but elevated levels of asbestos-related disease have been found in the miners, millers, and the local population. Another major area of concern is naturally occurring asbestos found in rock outcrops in parks and residential areas. SEE ALSO C LEAN W ATER A CT ; D ISASTERS : E NVIRONMENTAL M INING A CCIDENTS ; M INING L AW OF 1872 ; N ATIONAL E NVIRONMENTAL P OLICY A CT ; R ESOURCE C ONSERVATION AND R ECOVERY A CT ; S MELTING ; S UPERFUND . Kesler, Stephen E. (1994). Mineral Resources, Economics and the Environment. New York: Macmillan. Marcus, Jerrold J. (1997). Mining Environmental Handbook: Effects of Mining on the Environment and American Environmental Controls on Mining. London: Imperial College Press. Ripley, Earle A.; Redman, Robert E.; and Crowder, Adele A. (1996). Environmental Effects of Mining. Delray Beach, FL: St. Lucie Press. Sengupta, Mritunjoy. (1993). Environmental Impacts of Mining: Monitoring, Restoration, and Control. Boca Raton, FL: CRC Press. Brosius, Liz, and Swain, Robert S. (2001). "Lead and Zinc Mining in Kansas." Public Information Circular 17, Kansas Geological Survey. Available from http://www.kgs.ukans.edu . Bureau of Land Management. (2001). "Abandoned Mine Lands Cleanup Program." Available from http://www.blm.gov/aml . National Institute for Occupational Safety and Health. (1995). "Report to Congress on Worker's Home Contamination Study." NIOSH Report No. 95-123. Available from http://www.cdc.gov/niosh . Methane, a potent greenhouse gas trapped inside coal, can be released into the atmosphere when coal is mined. The 1993 President's Climate Change Action Plan encouraged the recovery of a possible 100 trillion cubic feet of this coal-bed methane for energy. This would reduce methane and carbon dioxide emissions overall, because burning methane produces less carbon dioxide than burning fossil fuels. Scientists from the United States Geological Survey are studying how to extract coal-bed methane without harming the environment. Current difficulties include how to dispose of the water that permeates coal beds and must be pumped off before methane can be released, and how to prevent methane migration. Methane, possibly from coal-bed methane mining, has been discovered in groundwater in residential neighborhoods. can you please add the fact of how the mines can cause minimal environmental damage to the earth. you already wrote about the disadvantages but you should also write about the advantages. it would help us know how it is helpful to the future of the earth and the upcoming generation. The text here seriously helped me in doing my research, and most of all I say kudos! to the person that putted this things, i most confess you are wWONDERFULLLL!!! SO INTERESTING! I Like your effort to change the minds of many.